The majority of Hearts Fall (2005) was recorded live-off-the-floor as a trio (vocals & guitars, piano/violin and double bass) in one snowy afternoon session at the Staircase Theatre in Hamilton Ontario, early 2005. Tom Howell, James Thomson and I played through each song one or two times on stage sans audience (on a Monday when the theatre was dark) while Ian Gibbons captured everything on remote recorder. Then later that summer, Gary Craig added drums and percussion to the best of the tracks at the Rogue Studio while James Paul sat at the board. To finish off, we tweaked a bit… redid one guitar solo, jangled some bells and threw in a small choir of humming men. And, that’s how this record happened. 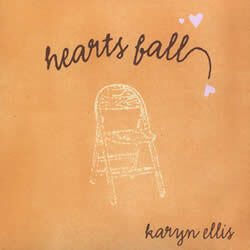 …charted #14 on CFBX (Kamloops, BC) Top 25 Roots/Country Albums for 2006. …appeared on Chris Kijn’s Top-Ten picks for album of the year in 2006. See 3voor12 webradio Netherland. at various times throughout 2006. Oh, and the CD spent over 6 months on campus charts across Canada and has been in regular rotation on national and regional CBC radio one programming since its release. Woo!